Blake Griffin celebrates after a basket against the Warriors during the fourth quarter Saturday at Little Caesars Arena. Blake Griffin scored 18 of his team-high 26 points in the second half as the Pistons (13-7) moved to 5-0 on this six-game home stand. The Detroit Pistons have had impressive wins early this season. The best one came Saturday night. 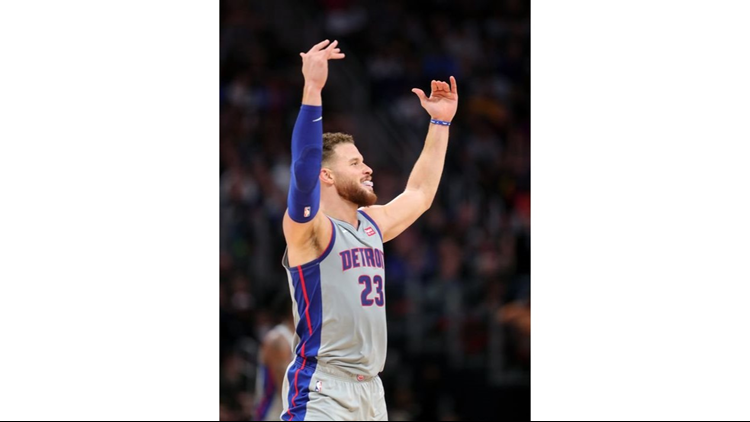 The Pistons led most of the way in a 111-102 victory over the two-time reigning NBA champion Golden State Warriors before a sell-out crowd at Little Caesars Arena. Stanley Johnson scored 19 points as the Pistons have won nine of 11 to stand fourth in the Eastern Conference under first-year coach Dwane Casey. It was Warriors guard Stephen Curry’s first game back after missing 11 games with a groin injury. He scored 27 points, but was 3-for-9 from 3-point range. Durant scored 28 points, but was 1-for-7 from 3-point range. The Pistons, with one of the best 3-point defenses in the league, held the Warriors to 6-for-26 shooting from the behind the arc. Reggie Jackson scored an efficient 17 points on 6-for-12 shooting. Andre Drummond finished with 16 points and 19 rebounds, but his slump at the free-throw line continued. Johnson may have been the best player on the floor in the first half in staking the Pistons to a 54-46 lead. Johnson scored 13 points on 6-for-11 shooting. He added five rebounds and two assists in 13 minutes. He was at his best midway through the second quarter when he scored six straight. A driving layup gave the Pistons a 39-31 lead. With the shot clock winding down, he hit a tough turnaround jumper in Durant’s face to give the Pistons a 41-33 lead. And his flying tip-in of a missed shot gave the Pistons a 43-33 lead with 5:44 left in the first half. After scoring 27 points on 7-for-13 shooting in a rehab assignment for the Pistons’ Gatorade League affiliate in Grand Rapids on Friday night, Luke Kennard (right shoulder sprain) was available against the Warriors. Pistons coach Dwane Casey made the announcement during pregame media availability, although he wasn’t active. The Warriors don’t exactly represent a chance to ease a player back into action after missing 15 games.